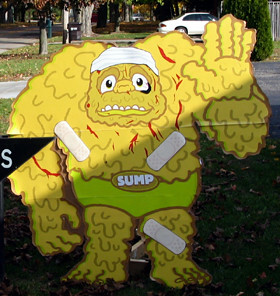 Fine art, Illustration, graphic design and the art philanthropy of Sam Morrison: SUMP Still Standing! Shortly after I got those horrible photos of a bloodied and bruised SUMP I left work to retrieve him! Actually, before I left work I grabbed (or rather printed out)a few band-aids and a head bandage. The kidnapper's photos depicted a Diversified Technologies sign. I wasn't immediately familiar with the name. So I had to look them up. They were located on one of the main streets in Vicksburg. I found the building quickly enough. Hard to miss since bloodied SUMP was next to their sign. The folks inside didn't seem to know how he got there or why. They actually didn't notice SUMP until I pointed him out. Fortunately for me they were somewhat familiar with the VOTE SUMP project. (They saw a window flyer in town and visited the site). So, I didn't have to explain much (other than the kidnapping). 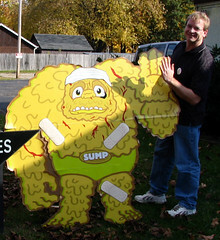 They were actually amused (and of course puzzled) that they were chosen as a dumping ground for SUMP. They were going to do some asking around to see if one of the owner's kid's friends had something to do with the kidnapping. I thought that was an excellent way to bring closure to the kidnapping. So thank you Diversified Technologies!